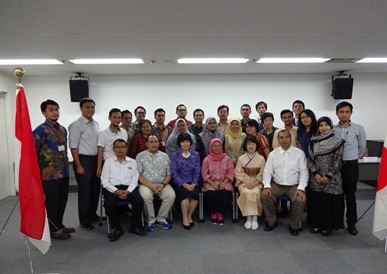 JICE implemented a training program for 22 governmental officials from Indonesia, headed by Ms. Wiky Witarni, Head of Sub Division, Training Planning and Implementation, Center for Planners Development, Education and Training, National Development Planning Agency (hereinafter referred to as “BAPPENAS”) from August 23rd to September 5th, 2015. This program is one of the non-degree schemes under the SPIRIT Program (Scholarship Program for Strengthening the Reforming Institution), which is a human resources development program managed by BAPPENAS based on the loan from the World Bank since 2012. Participants were selected from 10 Participating Agencies of SPIRIT Program (State Ministry for Administrative and Bureaucracy Reforms, National Institute of Public Administration, National Civil Service Agency, Ministry of Home Affairs, Ministry of Foreign Affairs, Ministry of Finance, Financial and Development Supervisory Board, Supreme Audit Board, Investment Coordination Board, and BAPPENAS). Many of them are middle management class officials in charge of human resource development/personnel management. The curriculum on personnel evaluation system mainly covered the system introduced as a part of the reform of public servant system in Japan through the guidance of National Personnel Authority and Japan Association for Public Human Resources Development. 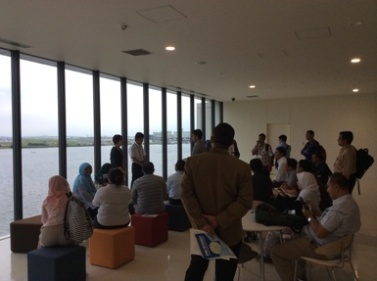 It also covered the case studies of local municipalities and private sectors through the guidance of Professor Takuya Tsuji, Executive Vice President for Planning and Evaluation, Hitotsubashi University. 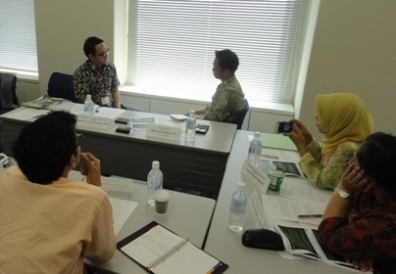 Participants experienced practical works through the simulation of personnel evaluation and interview. With regards to governmental reform and innovation, the curriculum covered the topics such as resident participation, budget screening, disclosure of government information, and big data utilization in public service with case studies respectively. Personnel evaluation and innovation are different and independent topics respectively, and participants’ interest level varied according to their work responsibilities and specialties. However, both topics are mutually related in that both have an impact on public servant’s motivation, human resources development, and improvement of public service. In Indonesia, the bureaucratic reform and improvement of the competency of human resources in national and local level are with higher priority. JICE expects that the outputs of this program will be applied to actual practice by each participant. JICE has the experiences to conduct the training program twice under SPIRIT Program (the program for 21 officials in charge of human resource development from 9 Participating Agencies in September, 2012, and the program for 10 diplomats from Ministry of Foreign Affairs in April, 2013). JICE will maintain and strengthen the collaboration with BAPPENAS and the related organizations, contributing to human resources development in Indonesia.